Stories from the Alabama Gang are legendary. Farmer, the Allisons and Bonnett are some of the forefathers of our spot, but as we told you recently here on Speed51.com, the news is already spreading about the new Alabama Gang (click here for the story). And on Saturday night at the all-new Montgomery Motor Speedway, two of the members defended their turf and duked it out with each other in a $5k to win 125-lap independent Super Late Model race. the race, regained the lead after a pitstop and then lost the lead when Charlie Bradberry pulled a move for the ages late in the race. “It scared me because I didn’t know what happened,” JR would say later. Norris ran up on Johnny Brazier who was fighting to stay on the lead lap and those two got tangled up for a brief second. And in a blink of an eye, Bradberry put it to the outside, went three abreast into turn-three and passed both of them to move into the lead. “I’m glad Charlie was on his toes like he was because it could have been a really bad mess. Charlie did a real good job of missing that,” continued Norris. And then the battle was on. Norris, with the more dominant car, tried to get under the #78 repeatedly, but Bradberry was using his head and protecting the low groove. Bradberry gave it all he could at Montgomery. And that’s eventually what Norris did. He made the move stick with just a handful of laps to go and then fought off Bradberry during a caution that set up a 3-2-1 finish. “Charlie ended up finishing second and he knows I didn’t do it on purpose. I just wanted to win. He and I are real good buddies. His time will come again soon,” said Norris. “We had a good car tonight, just couldn’t catch the 5-car,” Bradberry said. The Richie Wauters/J.R. Norris combination is tough to beat, especially in the equipment Wauters provides. “Yeah, but they can be beat, I guarantee you that,” stated Bradberry. 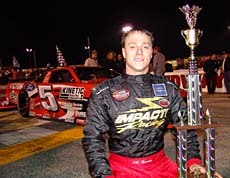 Norris was just glad to be done with the race, which was his first since the Snowball Derby (at Five Flags Speedway) in early December, and finish it in victory lane. In his so-called downtime, Norris has been working with the #15 Craftsman Truck Series team in which Wauters is crew chief for. Both were at the Atlanta Motor Speedway the night before the Montgomery race. 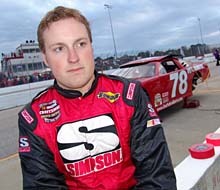 Norris also drives for Wauters in NASCAR’s Southeast Series, which opens April 30th at Greenville-Pickens Speedway in South Carolina. 25-year-old JR Norris and 22-year-old Charlie Bradberry might be buddies off the track, but it didn’t show at the half-mile Alabama speedplant. The two traded paint, pulled off amazing moves, and blew away the 23-car field to take the top two spots as the Super Late Models returned to the Montgomery track. 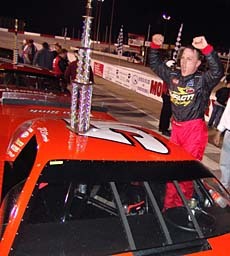 In the end, it was J.R. Norris, in the potent Richie Wauters #5 machine, which took home the hefty cash prize. The win for Norris didn’t come without a little controversy for the Wauters team. 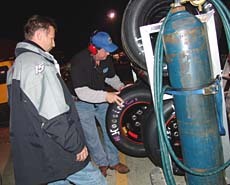 After qualifying the team had to fight off accusations of tire-soaking, despite the fact that they did not even win the pole (Jason Hogan did).